Located in NYC's historic East Village is a tiny jewel box of a bar tucked away behind Mediterranean neighborhood favorite, Local92. A confluence of inspiration - Blue Quarter was created as the ideal retreat from the hustle and bustle of the outside city streets, a nod to owner and head bartender's Max Green's love for tea and his penchant for the distinctive. Max's experience of working extensively with bitters at Amor Y Amargo, under the tutelage of Sother Teague, who is also involved on the creative side of the project; motivated him to focus on teas, which also have a bitter character. In addition, the Mediterranean restaurant Blue Quarter is housed in, offers an inspiring array of flavors for Max to seamlessly incorporate and make his own. 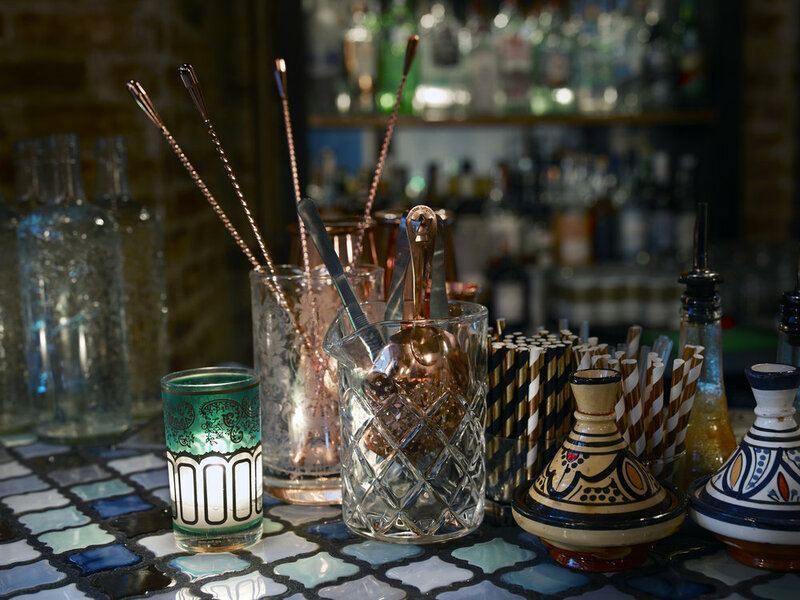 The menu is a harmonious play on reimagined classic cocktails as well as new, innovative and exotic creations you wouldn't find anywhere else. Either a play on tea infusions, tea syrups, or tea on its own, the Blue Quarter cocktail menu takes shape as a tea den for thirsty revelers along with several other standouts that pull flavors and colors from the Mediterranean to the Middle East as well as South East Asia. As you would imagine, the interior at Blue Quarter is inspired by the colors and textures of the Mediterranean. Warm blues and enchanting greens interplay with gleaming silver and copperwares under shadowbox light fixtures. Ornately designed glasses and charming service pieces, also used to deliver the more exotic cocktails, are influenced by teas of the world. The space is simultaneously whimsical and elegant, airy and cozy, alluring and welcoming. Step through the eye-catching large blue keyhole-arched door for a cocktail and an escape from the ordinary at the new Blue Quarter Bar.